Upcoming solo show at the Joel Gallery at The Bascom Center for the Visual Arts in Highlands, NC, I will also be teaching a workshop there June 26-30, 2017. April 14 - May 20, 2017. 3 person show at the Wilkes art Center, in North Wilkesboro, NC. "Gazing at the free form patterns and natural colours of a raku pottery finish is like looking at the colourful atmosphere of a mysterious world. Steven Forbes deSoule raku pieces are no exception and present exotic vistas that invite wonderful intrigue. 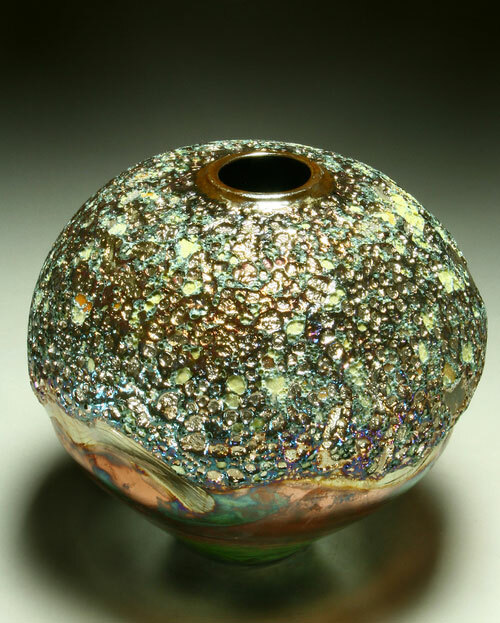 He introduces more green and blue hues, in addition to the typical earthy reds and orange raku colours, in the reduction process to enhance the colour diversity. He uses the raku standard of a steel rubbish bin for a reduction chamber, which I always view as a fantastic irony, relative to the glorious outcomes from raku firing. 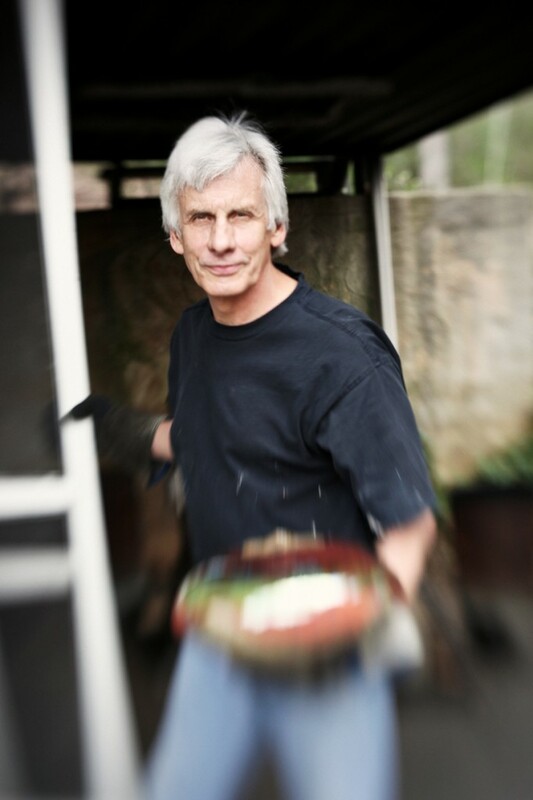 Steven Forbes deSoule has been a successful raku pottery artist for over 37 years, creating unique, hand made vessels and sculptures, while finding endless ways to manipulate the oxygen, gases and glazes during the raku reduction technique, to achieve a myriad of attractive outcomes. 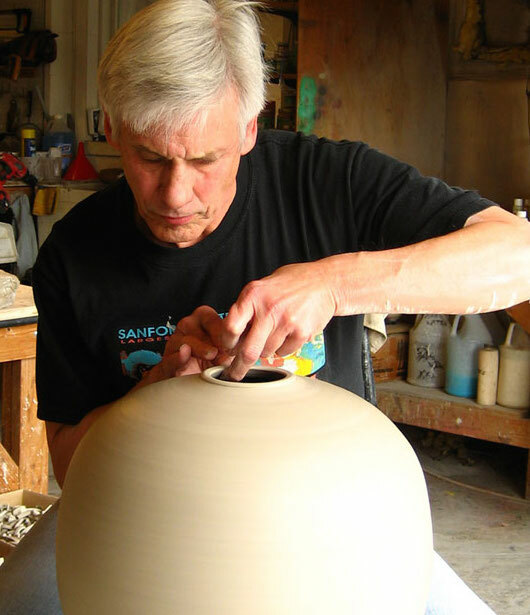 His intricate firing process and use of his own glazes and underglazes, with multiple firings, leads to ‘one of a kind pieces’ displaying beautiful enriched colours and textures. “The one constant with my work throughout the years has been transformation. I find it fun and challenging to try new things, and I especially enjoy developing new glazes. 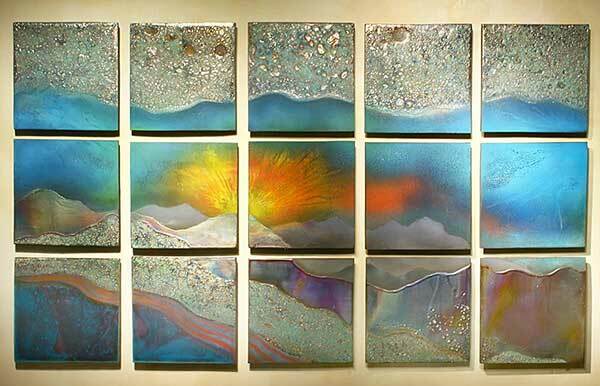 I started firing exclusively using the raku process in 1982 and found the element of serendipity and surprise to be invigorating.”"
I wanted to share a commissioned raku wall piece I did recently for Cathy and John Doolos. I think it fits nicely behind another vessel I did for them awhile back.. 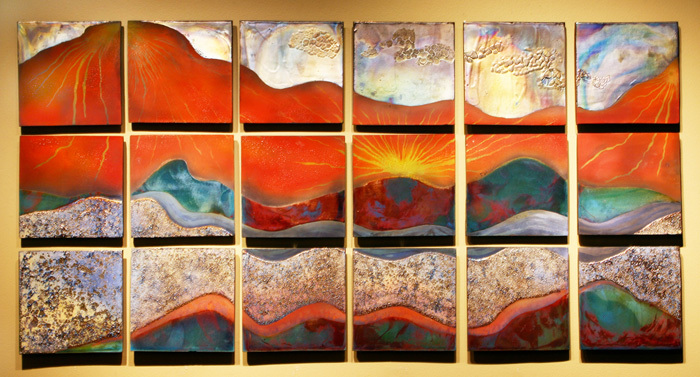 This intricate wall piece was created piece by piece using the raku process with my proprietary glazes. 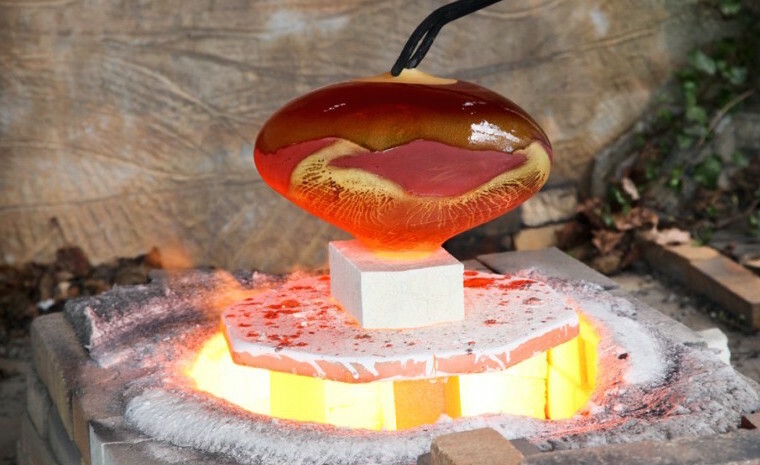 To learn more about how my work is done, please visit my raku firing page and please contact me if you would like more information regarding commissions. You can shop for my my available raku pottery here. Very happy to announce I've recently finished two commissioned raku pieces for the new City Centre in downtown Asheville. If you live in or around Asheville or will be visiting soon, please take a look! Happy to be exhibiting some of my latest raku pottery at this event. The upcoming invitational exhibition at the NC Pottery Center, entitled Flower Power: Pottery & Plants will be held at the NC Pottery Center, located at 233 East Avenue, Seagrove, NC 27341. Please join us for the Opening Reception on Saturday, March 12, 2016 from 12:00—2:00 p.m. The reception is open to the public and free of charge. "Within the context of this show, the term Flower Power is not a reference to the movement or ideology of the late 1960s and early 1970s. Here, Flower Power is a visual appreciation of the visceral and aesthetic power of pottery and plants. Individually, pottery, flowers, and plants have the power to affect our thoughts and feelings. When combined, that power is sometimes intensified, perhaps because of the symbiotic relationship between earth and nature. " Below are the raku pieces that I'll be exhibiting! Welcome to the WNC Design Guide, your source for handcrafted fine craft and art for elegant mountain living. Whether you have just purchased a home in the mountains, are building your dream home or just re-envisioning a current space, we hope this design guide will be a trusted resource for you as you select quality, local artists to fullfill your vision of a beautiful home here in Western North Carolina. As a curated group of artists, our work spans everything from handcrafted furniture to paintings, from functional craft to fine art. Every artist in our collective thrives on the collaborative process as we work with clients to create unique works of art for both residential and/or commercial spaces. Again, we hope you enjoy this collection and encourage you to share it with your friends. You can also access this entire catalog online at www.WNCDesignGuide.com.